This dispatch, written hastily on the 1st of January, may not be the kind of post you look for first thing in 2015. There are no promises of eating better, no crisp salad teasing you below. Instead, I offer you a soup with three cups of grated cheddar in it, plus some half and half. Clearly, I’ve no resolutions for 2015 insofar as eating habits go, but then again, I never have. I wanted to share this soup with you as far back as Thanksgiving, but work, book edits, and general winter fatigue got in the way. Weekends were busy with baby showers (mine), tree trimming parties, and various trips to find things for baby. And then about a week ago, just when our office was about to shut down until after New Year’s, I got hit with the kind of third trimester fatigue I didn’t know existed. I had heard of this phenomenon, which I’m told is followed by a burst of energy to prep for the baby, but I hadn’t given it much thought. Outside of general pregnancy discomfort, I have few complaints: no morning sickness to speak of and a fairly energetic (and hungry) first trimester. But this fatigue was something else. I’ve described to friends as that if dementors from Azkaban were sucking the life out of me. I’ve never felt this weak and exhausted – and I couldn’t nap either. The fatigue lasted about a week before lifting. I certainly hope it doesn’t come back again – if it does, I’m not sure I’ll be physically able to take on anything. But enough about babies and fatigue. I’d like to tell you about this soup. 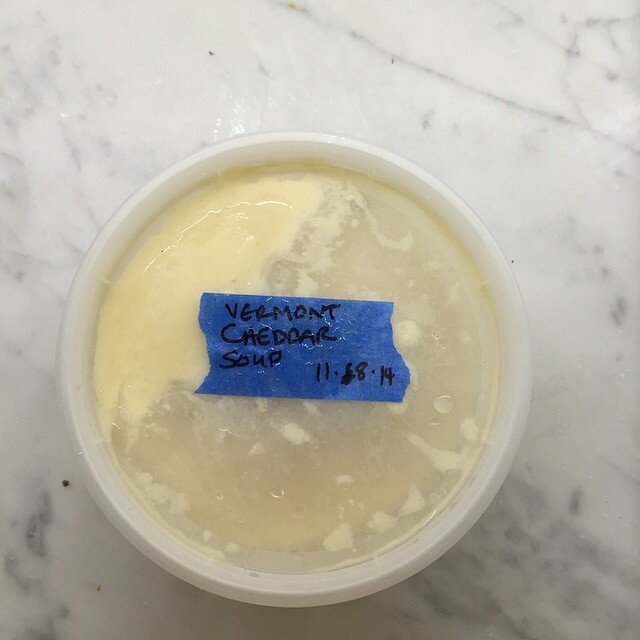 At least once a year, Andrew’s family goes to Quechee, Vermont, and when we all do, we have at least one lunch at the Simon Pearce restaurant where this soup is front and center – as in it never leaves the menu, which should tell you how popular it is. I don’t know how to describe it to you except it’s one of the most warming, comforting, and delicious soups I’ve ever had. And because Andrew’s family loves this soup so much, I decided to serve it at our Thanksgiving meal – where it was a hit, especially with our two-and-a-half year old niece, who promptly ate not one but two bowls. The recipe is in the Simon Pearce cookbook, but the way it’s written and formatted is a bit sloppy. I’ve cleaned it up below and kept it as is – the resulting soup tastes exactly like it does at Simon Pearce. If you can, don’t skip the blanched carrots and celery; they add a beautiful confetti-like look to the otherwise white soup. Apologies for the sorry picture up top. We were so excited by the soup, we never photographed – and if that’s not testament to how good it is, I don’t know what is. Lastly, before I go, Andrew just informed me that sometime next week, the Northeast, at the very least, if not beyond, is going to be frightfully cold. Single digits for highs, and single negative digits for lows. Salads and clean eating aside, I suggest you make a pot of this and keep it in the freezer (it freezes and reheats like a charm) on hand in case you want something to warm you up. 1. Bring a pot of water to a boil and blanch the carrots and celery for 30 seconds. Drain, shock in an ice bath, and set aside. 2. In a 4-quart pot set over low heat melt the butter. Add the onion, thyme, and bay leaf, raise the heat to medium-high, and cook, stirring, until the onions are translucent, 5 to 6 minutes. Decrease the heat to low and stir in the flour. Cook, stirring, until the flour and onion come together, and the roux (flour butter mixture) begins to bubble, about 2 minutes. Add the stock, 1 cup at at time, making sure the liquid is at a boil the entire time, and whisk until smooth. 3. Working in 2 batches, stir in the cheddar until the cheese is completely melted into the soup. Stir in half-and-half, and the reserved carrots and celery. Season to taste with salt and pepper. Ladle the soup into bowls and garnish with parsley. Since my sister brought me a two pound chunk of cheddar for Christmas ( a rare and precious thing here in Rome) this recipe came just in time. Elizabeth – I hope you make it and love it as much as we do. It’s a meal unto itself, but so nice to have when the weather gets damp and cold. Also, thank you for pointing out the TKs. I totally meant to fill them in (and add grams) – both are fixed now! OMG, it’s like you have some kind of crazy brain reading machine over there…I LOVE SIMON PEARCE and I LOVE THAT SOUP! Thank you so much for decoding this for me! Does the dried bay leaf add something extra vs a fresh one? I only ask as I have some fresh left over from a dinner…Thanks! My family wasn’t fond of the texture of the vegetables, but I thought it was a nice contrast. I made this last night and it was as good as you promised. I loved the texture of the blanched carrots and celery. Thanks! Ellen – hope you’re better from your bout with bronchitis! And I’m glad to hear you liked the soup!